This family friendly Campground Resort and Marina provides security first and foremost. To get into the resort you have to pass through gates, which to my mind is really a plus point, what with having young kids running around. 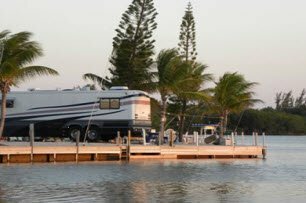 The whole camp ground is framed by the most wonderful and beautiful scenery, with your choice of either the Atlantic or Florida Bay right on your doorstep. You simply have to make your way through to either by using Tavernier Creek or Marvin Adams cut. Paved interior roads lead to gravel pads with full hookups and pullthrough sites, so it is especially convenient for RV vehicles. Across the site there are laundry facilities, with a clubhouse, LP gas, swimming pool, playground, a boat ramp, and dockage. It really has superb facilities which will allow for hour after hour of fun participating in fishing, diving, tennis, boating, basketball, biking, swimming, and much more. Tent sites are also counted among the features available. Pets are welcome as long as they are kept on a leash. Of course whilst you are at the campsite you will be looking for things to occupy yourself and the family, and these may be off site. The things that I would certainly recommend when staying at Calusa are of course the world famous John Pennekamp State Park , which we mentioned at the top of the page. This is heaven for divers with all varying degrees of experience. 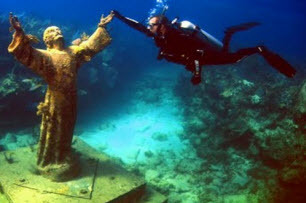 The image of statue of Christ of the Abyss has become a staple of all sites that focus in on the Florida Keys like ourselves. Another recommended attraction, which should appeal to all members of the family is the FKWBC aka Florida Keys Wild Bird Center, which is where the injured or orphaned birds discovered throughout the keys get nursed back to health. It really is a fascinating place to spend a few hours, and certainly I have been there numerous times over the years, and still get a great deal of enjoyment from the place. Lastly although you maybe in your own RV with cooking facilities a plenty, you are on holiday after all, so for a short drive of just under four miles, treat yourself to a really nice, if understated dining experience at Mrs Macs Kitchen. Mrs Macs Kitchen prides itself on true conch cooking and with Key lime pie to die for, it well worth a little drive. You never know you might forget about whats on Calusa Campground and let Mrs Mac do your cooking for your whole stay. ....I wouldn't blame you at all.